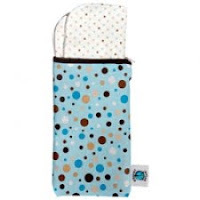 Many moms find using cloth wipes out and about more challenging. I think this is due to carrying moistened wipes and trying to stock fresh wipes before each outing. It’s either that or finding yourself with a dirty baby and musty smelling wipes. Yuck! My solution is to keep a small wet bag (or cosmetic bag or any small bag) in your diaper bag. Stock it with 8-10 dry wipes and a small squirt bottle or spray bottle of wipe solution or water. Then, moisten wipes as needed. Wet or dirty wipes go in to a bigger wet bag with your dirty diapers to be washed at home. Dry wipes go back into the small bag. Note: Planet Wise now makes a set that contains 10 wipes inside a wet bag...it's perfect! What's so convenient about it? Well when using disposables you have to place your dirty diapers into a wetbag for transport home and then you're left with soiled disposable wipes that you'll either have to carry around in a separate bag or find somewhere to dispose of them. With cloth you simply place the soiled wipes in your wetbag with your diapers and wash them all together! It's super convenient and makes diaper changes in public much easier. Heather Hicks. Copyright CDO, LLC. All rights reserved.